NEW: SOCCR2 can be accessed via https://carbon2018.globalchange.gov. 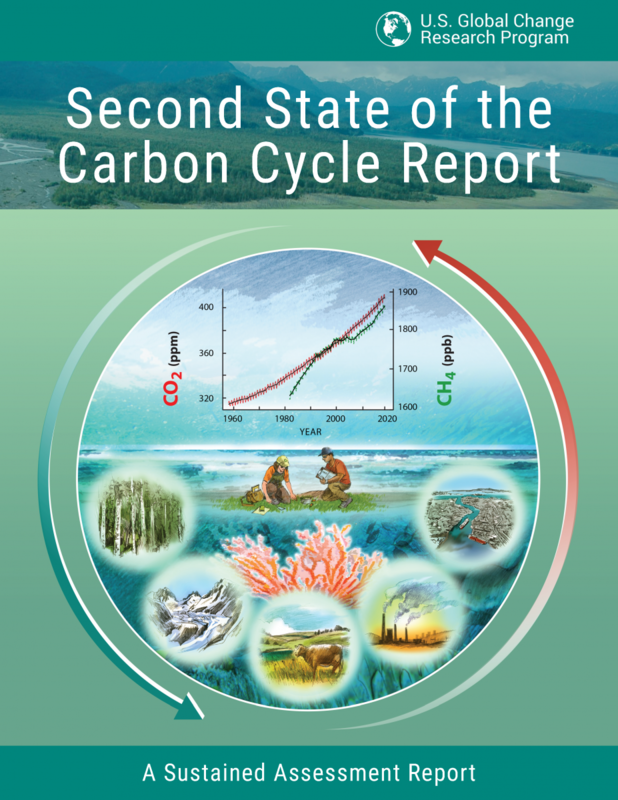 The PDF is the official version of the Second State of the Carbon Cycle Report. The report was released on November 23, 2018. SOCCR2 can be accessed via https://carbon2018.globalchange.gov. 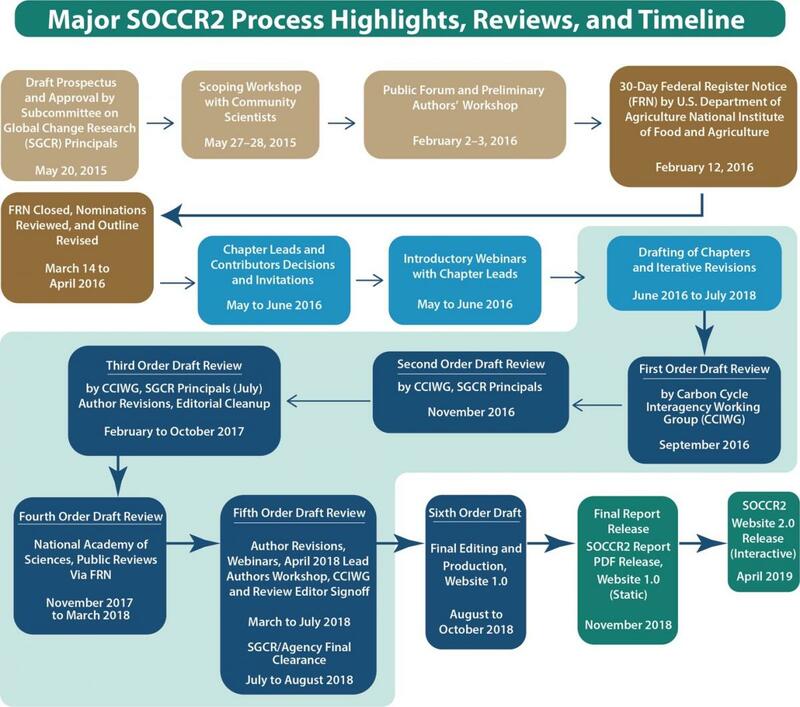 SOCCR2, Sustained Assessment report of the U.S. Global Change Research Program (USGCRP) was released on November 23, 2018. 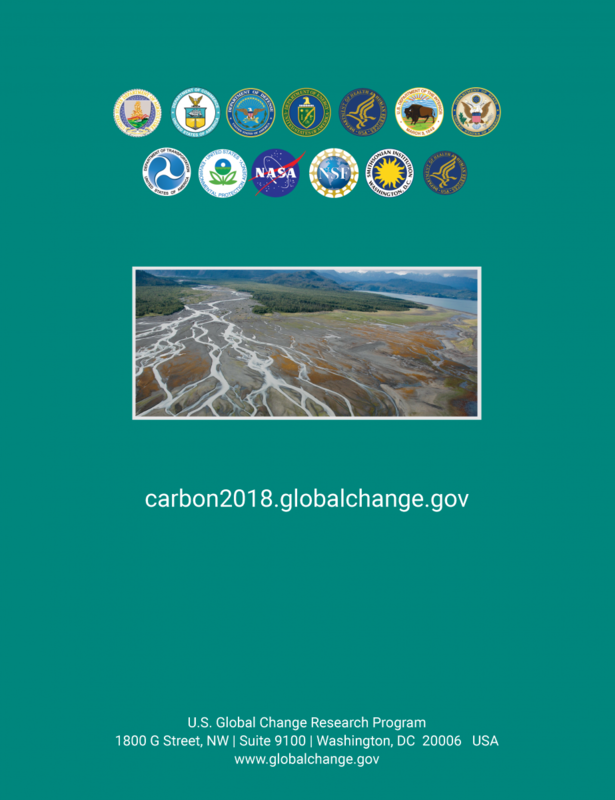 With over 200 contributing experts, this interagency Highly Influential Scientific Assessment was led by the Carbon Cycle Interagency Working Group (CCIWG) and U.S. Carbon Cycle Science Program under USGCRP auspices, and reviewed by 13 US Government agencies and departments, the U.S. National Academy of Sciences, and the general public. https://nca2018.globalchange.gov. SOCCR2 contributes to NCA4 Vol. II but is a stand-alone Sustained Assessment process report. Congratulations to the entire SOCCR2 team, whose commitment and hard work has been truly inspiring throughout this 3- years long process. 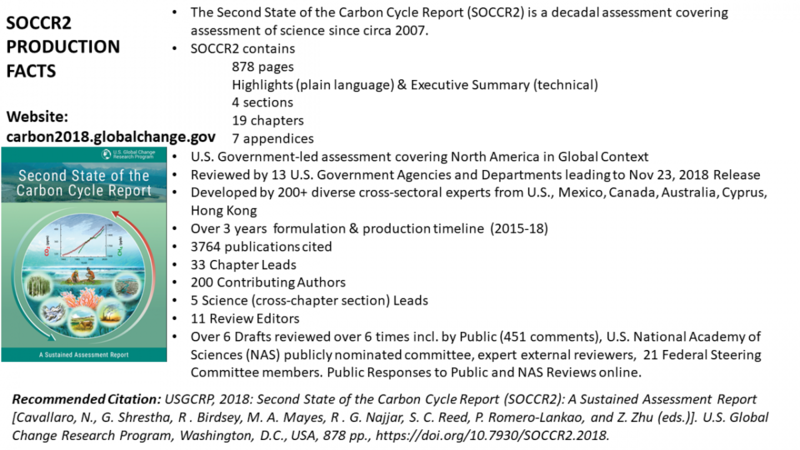 Thanks to all of carbon cycle science colleagues and friends who helped in many ways, including in producing and sharing the science, tools and and knowledge assessed in SOCCR2. In 2015, the Carbon Cycle Interagency Working Group (CCIWG), via the U.S. Carbon Cycle Science Program, initiated plans for the 2nd State of the Carbon Cycle Report (SOCCR2) as a follow-up to the 1st SOCCR (2007) which was a Synthesis andl Assessment Product (SAP 2.2) of USGCRP, and as a product of the Sustained National Climate Assessment. Led by the CCIWG, under USCGRP auspices and with USDA as the administrative lead, this federal interagency report is currently in development and estimated to be published in the fall of 2018. The focus of SOCCR-2 is on the scientific understanding of U.S. and North American carbon cycle stocks and fluxes, in the context of and interactions with global scale budgets and climate change impacts in managed and unmanaged systems. Carbon stocks and fluxes in soils, water (including oceans), vegetation, aquatic-terrestrial interfaces (coastal/ estuaries/ wetlands), human settlements, agriculture, forestry etc. are included. Relevant carbon management science perspectives and support tools for supporting decisions, as addressed in and related to the US Carbon Cycle Science Plan (2011) and U.S. National Climate Assessment, USGCRP 2012-2021 Strategic Plan and Global Change Research Act (GCRA) of 1990 will are included in this assessment. In addition to identifying uncertainties, rising opportunities for improving measurements and projections in the carbon cycle are be identified. 30-day Federal Register Notice (FRN) (released on February 12, 2016) by USDA-NIFA, on behalf of the CCIWG and USGCRP, is available here. The PDF of the FRN is available here. The deadline for submission of nominations for contributors, technical input and comments on the draft prospectus was March 14, 2016. In addition to the above section, details on prior CCIWG-led SOCCR2 public engagement and outreach events and related opportunities can be accessed via the chronological list of public announcements below. Please check https://www.carboncyclescience.us/news, subscribe to @USCarbon and/or subscribe to Carbon News for updates. We are preparing for the Public Comment Period of the 2nd State of the Carbon Cycle Report Fourth-Order Draft. This 1-day public forum will present an opportunity for interested parties and stakeholders to provide individual input on proposed SOCCR-2 themes. Some background documents related to the earlier SOCCR, released in 2007, are available below. The carbon cycle chapter of the Strategic Plan for the U.S. Climate Change Science Program describes a vision to publish a series of government products on the status and trends of carbon emission and sequestration. 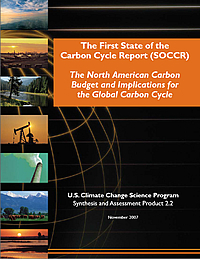 The first of these reports, the State of the Carbon Cycle Report (SOCCR), was released by the US Climate Change Science Program (now the USGCRP) on November 13, 2007. The 2003 Terms of Reference for the first SOCCR (2007), prepared by the Carbon Cycle Interagency Working Group and in consultation with the Carbon Cycle Scientific Steering Group, envisioned a report designed to provide accurate, unbiased, and policy-relevant scientific information concerning the carbon cycle to a broad range of stakeholders. The SOCCR Coordinating Team focused on (1) summarizing our knowledge of carbon cycle properties and changes relevant to the contributions of and impacts upon the U.S. and the rest of the world, and (2) providing scientific information for U.S. decision support focused on key issues for carbon management and policy. The report depends on results from comprehensive and informative programs, such as the North American Carbon Program and Ocean Carbon and Climate Change Program, and demands a global perspective, integrating information from studies on land and in the atmosphere and oceans around the world. The expected audience includes researchers, decision makers in the public and private sectors and the public. The Executive Summary is available here. Background documents, prospectus, prior draft versions, review comments and responses from the first SOCCR (2007) are available here and below (source: http://cdiac.ornl.gov/SOCCR/documents.html).